I’m getting a lot of questions from cam girls who just started their own website on how to get links to their site from other sites. Links to your site is one of the most important things if you want it to survive among thousands of other similar websites. Links will be constantly bringing you fresh traffic of fans that you can make money from by selling cam shows, picture sets, videos, used pants, etc. It’s not that hard to get links to your site and here I’m going to explain the FREE way of doing this. Also after reading this article you’ll be able to get text link pointing to your site – GUARANTEED! But first a little bit of theory. There are two types of links – text and image. 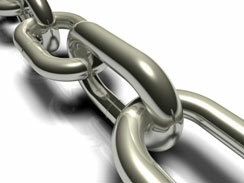 You need to hunt for the text links because they are very good for search engines like Google. When Google sees text link pointing to your site it starts showing your site in search results (when somebody types certain phrase in Google). This can bring you tones of FREE traffic. This means that the site owner offers you to exchange links. All you need to do is send him an email to specified email address where you should specify what text you want to use for the link (in most cases it could be your website name) and address of your website (URL). For example in this section you can see a link with the text “Cam Girl Nikki” that points to http://camgirlnikki.com/ . Note that this kind of sites like webcams411.com will ask you to put a link back to them. You can put this link in the sidebar or on special “Friends” page. Getting links to your site is one of the most important factors that determines either your site will succeed or will be dead like many other sites in the Internet. So if you decided to run your own site make sure you constantly hunt for the links. There are tones of other sites like webcams411.com that offer link exchanges. Just make sure that the site you exchange links with is clean without crazy popups and some other “stinky” stuff. webcams411.com already spammed me with their website and I am not impressed with them at all. If they were anything of popular they wouldn’t need to contact people for business. I don’t agree. Yes webcams411.com is not that popular but they are growing their site. That’s why they are looking for new sites to feature. Their site has page rank 2 which means that they get pretty solid search engine traffic. All new sites start with page rank 0 so it’s very important for them to get link from the web site with page rank 2. I know one model has recently exchanged links with them and now she’s getting very good traffic from their site. First, I want to thank you all for the kind comments. I am happy that my site is providing good leads for the models who I promote. It makes it all worthwhile to hear that my traffic is converting. As far as the spam comment is concerned, yes, I do promote my service to freelance webcam models – I do this via blogs, message boards, forums and direct emails. I am not trying to sell anything – I am simply promoting a free service to help others in the adult industry promote their sites and services. Spam is about mass mailing to an un-targeted audience. I have never engaged in such tactics and never will. My messages are targeted specifically to webcam models who I feel can make use of some free promotion. Agree with you Andy. You market yourself in legitimate way. Without this none site will survive. Spam is also about being unsolicited, another annoying aspect which I define spam are ignored unsubscribe requests or just fake unsubscribe instructions. I agree and I feel that it is important to find sites like webcams411 to be listed on. I also feel that many cam models do not take advantage of trading links. I have a friends page where I feature other independent cam models. My friends page is one of the more popular pages on my site after photos and shows. I’m not sure why other models do not take advantage of trading with others. If any independent cam models want to trade links with me, please visit my site friends page at lorrainelive.com. Thanks! Oh, you are welcome! Thanks for the warm words! I think models could ask reviewers to include them in their reviews. Or just simply write reviews of cam models themselves. Review sites like this ( http://sexcamtips.com/ ) have a nice traffic, and review traffic converts well in general. Link exchange or offering content in exchange of links can work. I am wondering about the webcam 411. I do not see the section you are talking about. Maybe it has changed over the years but do you know if webcam411 still has the link exchange program.